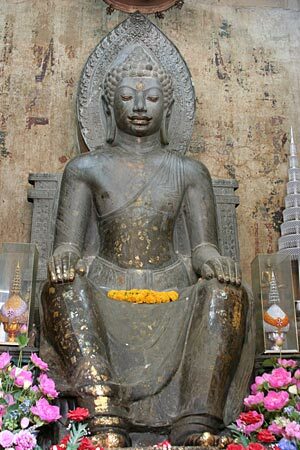 Dvaravati art - Buddha Image at Wat Na Phramen, Ayutthaya. Notice that the Buddha is seated in the 'European style'. 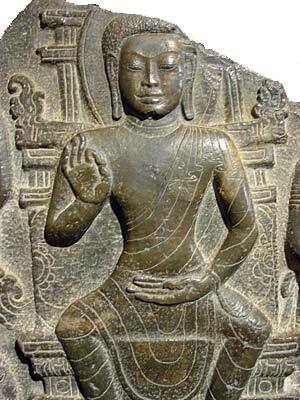 The Buddha displays none of the 'classical' mudras, and His Hands are laying peacefully palms down on His Knees. Dvaravati refers to a kingdom situated in the Chao Phraya river basin between the 7th and 11th centuries A.D. Presently Dvaravati art, including many Buddha images and sculptures, can be found at National Museum in many provinces of Central Thailand, such as Phra Pathom Chedi National Museum, Nakhon Pathom, U Thong National Museum (Suphan Buri), Prachinburi National Museum. All the above mentioned National Museums are certainly worth a visit. The Dvaravati style derived from Indian archetypes such as Amaravati and Gupta styles, and were integrated with local art. 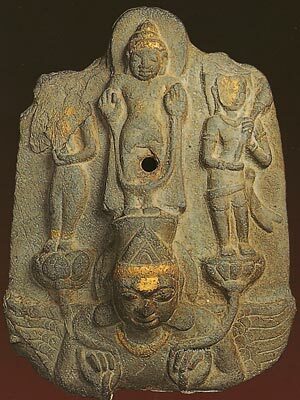 Dvaravati art and images went roughly through three stages : In the initial stage, there was heave Indian influence, later on the art became more independent locally, and still later influence of Khmer art is visible. So, initially the faces depicted would resemble Indian sculptures. Later on, influenced by local styles, the aureole would appear in a lotus bud shape or orb over the cranial protuberance. Large hair curls are visible, and the eyebrows would resemble a crows wings curve, like a flying bird. Protuding eyes, with flat nose and thick lips are common. Standing Buddha images performing the Vitarka (Preaching) posture, with robes hanging to mid shin level (see example). In sitting images, a short mantle is placed over the left shoulder. Khmer influence became visible later on with a more square face and cleft chin. 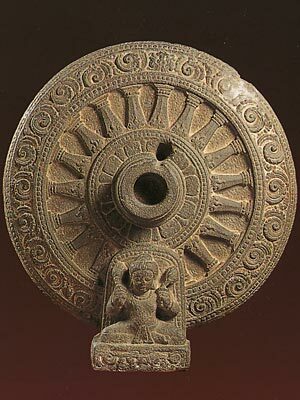 The Dharmachakra wheel (see picture at bottom) is very typical of Dvaravati art. The wheel was likely positioned on large pillars at places of worship. The Dharmachakra wheel symbolizes the Buddha's turning of the Wheel of Truth or Law. Often the Dharmachakra has eight spokes, symbolizing the eight-fold Noble Path. The Buddha is known as the Wheel-Turner : the One who sets the cycle of teachings in motion and in consequence changes the course of destiny. It is worth remembering that during the early centuries of Buddhism, no sculptures of the Buddha were made, and the Buddha was represented by various symbols such as the Dharmachakra, the Bodi Tree, the Buddha's footprints etc. 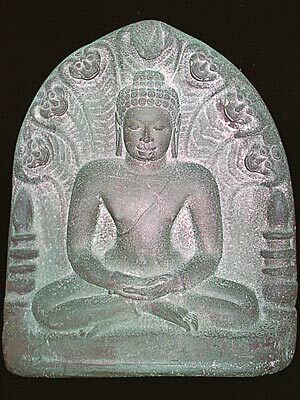 Dvaravati art - Buddha, protected by Naga in meditation posture. 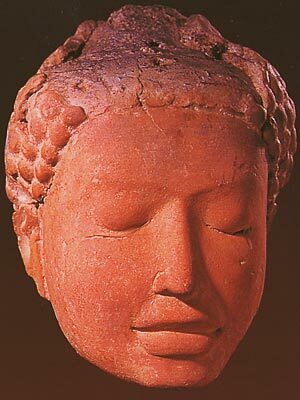 8 - 11 th century A.D.
Found at Si Mahosot, Prachinburi province. Now in the National Museum, Bangkok. Now present at National Museum, Prachinburi. 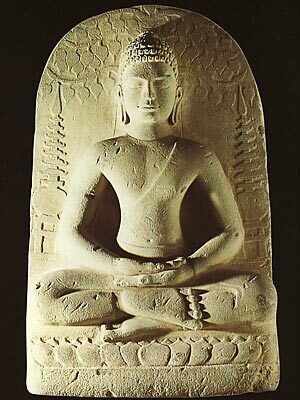 Dvaravati art - Sitting Buddha in Meditation Posture. 8 - 10th century A.D.
Dvaravati art - Buddha standing on Arunaditya. 7 - 11th century A.D.
Now present at Phra Pathom Chedi National Museum, Nakhon Pathom. 17 cm high Terracotta image. Found at Wat Phra Ngam, Nakhon Pathom. Now present National Museum, Bangkok.